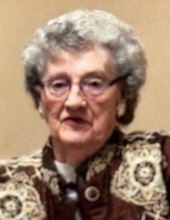 Mary Ellen (Taber) Bellows, 92, of Morris passed away on Monday, January 21, 2019 at Cooperstown Center Nursing Home in Cooperstown. Ellen was born in Herkimer< NY the daughter of Harry and Genevieve (Strong) Taber. Ellen graduated from Oneonta High School and worked at the Palace Theatre in Oneonta as an assistant cashier and usherette. She worked in Scintilla in Sidney as a coil winder during WWII and later worked at the Oneonta Country Club. Ellen and Clayton were members of the Sidney Boat club from 1959 to 2013. They enjoyed their boat and camping. Ellen had a green thumb and produced beautiful gardens. She was predeceased by her husband Clayton of 65 years; her sister Ruth (Taber) Coss and her husband Paul Coss; brother, Harry Strong Taber and his wife Naomi and a nephew, Richard Taber. Ellen is survived by her son Stephen (Penny Lee) Bellows; daughter Lucinda (Joseph L.) Miller, all of Morris,; her grandchildren, SSgt. Kevin (Tiffany ) Ferguson of Brunswick, ME., Erik (Brittany) White of Saranac Lake, NY., SSgt. Thomas Wallace of Newport News, VA., Dan (Jamie) Truax of Fulton, NY, Randi Perkins of Otego, NY; a niece, Carol (Riley) DeAngelis of Tampa, Fl. ; two nephews, Phillip and Ronald Taber of Sidney Center and Six great grandchildren. A graveside service will be held in the Spring at Hillington Cemetery in Morris, NY. Online condolences may be made to the family at www.johnstonfh.com. Arrangements have been entrusted to the Johnston Funeral Home of Morris. "Email Address" would like to share the life celebration of Mary Ellen Bellows. Click on the "link" to go to share a favorite memory or leave a condolence message for the family.